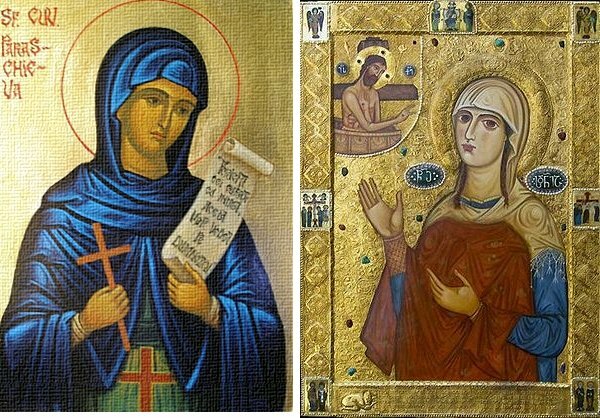 What resemblance is between Saint Sidonia from Mtskheta (Georgia) and Saint Paraskeva from Iasi (Romania), two pious virgins celebrated on the same day, October 14? Two holly brides: one was giving her rich clothes to the poor, thus bestowing them to Christ, the other received from Christ the most precious garment - His shirt, brought to Mtskheta by her brother, rabbi Eleazar -, which served to her as well as a burial and a wedding cloth. What is the link between the column of light seen in the fourth century over Sidonia's tomb, after cutting the secular cedar that had risen from her grave, over which the famous Svetitskhoveli cathedral was build, and the mantle of light with which Paraskevi was seen protecting Iassi - as survivors remember - during the WW2 bombings? What binds together the two equally discrete virgins, both equally rushed passing the threshold of earthly life, but equally spectacular in their heavenly destiny, whose glory is ceaselessly growing and will continue to grow? The relics of one have wandered across the whole Balkan Eastern Christendom (from Epivat to Trnovo, Belgrade, Constantinople and Iasi), of the other were sealed until the end of time under the slabs of Svetitskhoveli Cathedral, to expect there the bridal coming of Christ on earth, Parusia. Two columns of light, two maidens clothed in Christ, united by the same great love.